Does Pallet Central Enterprises own its trucks? What types of transportation services do you offer? Pallet Central Enterprises (PCE) serves the entire continental United States, and Canada. A customer can place an order and/or receive a sales quote in one of two ways. By visiting the "PCE Sales Request" page, a customer may fill out a simple form. Or a customer may call the Pallet Central Enterprises (PCE) Main Office where a National Sales Representatives will be assigned to their account. See the Contact Us page for further information. Yes. Customers with numerous weekly loads and/or long loading times may choose to utilize drop trailers. No. Pallet Central Enterprises is a non-asset brokerage. Our trucking division, Pallet Central Express, works with regional and long haul carriers to obtain the most cost effective solution for our customers. 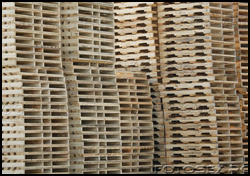 Pallet Central Enterprises offers customers an array of products and services. A listing of these may be found on the PCE Services and PCE Products pages. Pallet Central Enterprises offers its customers a number of choices; though, a majority of freight is transported on 53 foot dry vans, flatbed trucks are available.